Marijuana contains the mind altering chemical THC, which can affect mood, concentration, judgment, senses, movement, and memory. Short-term effects of marijuana depend on how strong the THC is, and whether alcohol or other drugs are used at the same time. Long-term use of marijuana can cause serious mental, physical, and social problems, including addiction. Other important things to know: the amount of THC in marijuana can be different depending on the type of plant, which part of the plant is being used, where it was grown and prepared, and finally, how it is stored. 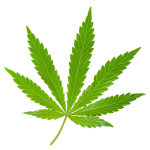 Marijuana is typically smoked as a “joint” (cigarette), a “blunt” (hollowed out cigar made of tobacco leaves), in a pipe, or a bong. Marijuana, or concentrated THC extracts or oils, can also be vaporized and inhaled (“vaped”), mixed into foods, or brewed as a tea. When someone smokes marijuana, the THC travels through the lungs and into the bloodstream. When it reaches the brain, THC connects with the nerve cells that affect memory, concentration, perception, mood, and pleasure. This is what is called a “high”.